You understand how trying to maintain that ideal body shape without a personal trainer can be tough and boring? In many cases, it becomes tiring to work out on a daily basis without a coach or either way working out alone; never sounds fun at al. Do you find your daily gym workouts tiring? I bet Updown Fitness should be your companion! 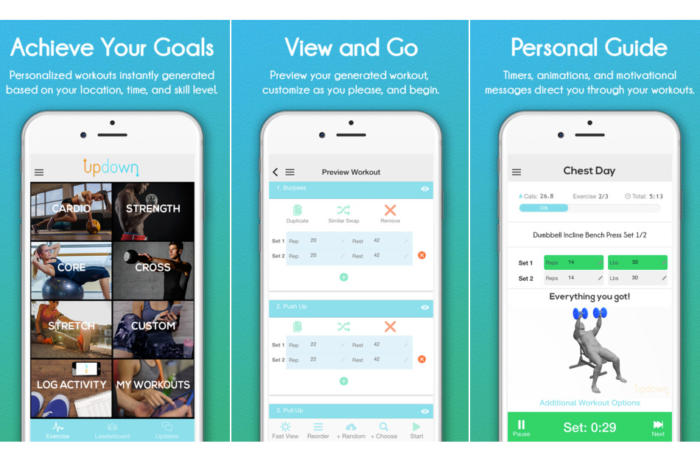 Updown fitness app has the power to turn your iPhone into a personal trainer to help you achieve your fitness goals. 1. Cardio: includes workouts meant for maximum weight loss and burning of calories. 2. Strength: includes activities intended to improve building of muscles by focusing on specific body areas. 3. Stretches: includes workouts designed to improve your flexibility. 5. Cross: includes routines designed to improve one’s muscular endurance. Updown app is a royal companion as you get to personalize it according to your specific needs and requirements within a minute, that is you get to choose your preferred workout category together with its’ duration, location and the intensity too. Experts recommend that to experience a maximum shift; the user should find the perfect combinations of the workout categories. The developers had the users in mind while coming up with this app, and therefore designed much straightforward and user-friendly way so that every user can get the best out of it. Their primary objective was that each user gets to achieve their body shape and weight goals. The Updown Fitness app is unique; that is in it has social features which allow the user to add friends to his list and share workouts with them. The social feature encourages the user through the fitness journey and motivates them through competitions with his added friends where he will always want to lead the board. Different from other fitness apps in the store, Updown Fitness app is completely free! Does that not sound cool? For the Updown Fitness app, you don’t need to pay to download it in store or be asked to spend a coin to unlock any additional feature. Also the fact that it has very simple interface enables the user to navigate easily through the available platforms hence complete achievement of the goals. The app’s functionality can be described as intelligent and expert companion based on the fact that it guides you on how to reach your goals. It asks you to increase or reduce your weight and preps based on your target goals. The social feature motivates the users hence reaching the target goal becomes easy. Has a variety of workouts in animated videos to refer to during the exercises. The workouts get disrupted by incoming calls or messages. Require data connections to access through the various featured platforms. Without saying much, the app has many benefits as to the disadvantages. Over years, this app has been known to be ‘referred by many app’. Therefore, if you are looking for better home workouts results, ensure you download the app on iTunes for free and let it do magic on your behalf. The developers had the users in mind while coming up with this app, and therefore designed much straightforward and user-friendly way so that every user can get the best out of it.